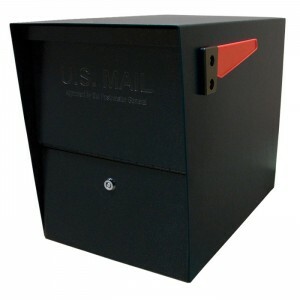 The Mail Boss Package Master is an ideal solution for a residential locking mailbox for any homeowner who want to receive larger packages and still have the security of a tough steel locking mailbox. Just about anyone who gets packages delivered to their home recognizes quite often they won’t fit in a normal mailbox and must end up unattended on your porch. In great weather this may not be a problem, but bad weather as well as mail thieves, may wreak havoc on your expected delivery. With a few of the larger mailboxes now available, small packages can be dropped into the box by the curb of the road or mounted on your home. Luckily there are lots of mailboxes available that may supply you with the means of receiving these deliveries. Many of the options will support boxes measuring just about 10-inches by 10-inches by 13-inches, around the average size of commercial delivery services. On top of the size to allow for larger packages, many provide extra security by having the carriers drop the mail into an area secured behind a locked door. There are two primary kinds of package letter boxes. You have the style that can be mounted on a pole and the style that stands over four-feet tall and may be utilized for a road-side mail box for rural deliveries. Other versions are a bit smaller for use as house mounted letter boxes for attaching to your house. Most styles also include a separate, non-secured area for outbound mail making it easy for the letter carrier to get access to your outbound mail while providing security for your inbound mail and packages. Today’s mailboxes are made of durable metals, which will guard them from vandals or mail theft. This is also helpful to safeguard them from damage from individuals trying to cause damage with baseball bats and even small explosive devices like M-80 fireworks. The added strength and security measures supply the security for your mail, along with serenity if you know your items are secure. With incidents of identity theft on the rise these locking mail boxes are becoming more popular, especially in locations where the mail box may be separated from view, providing sufficient time for thieves to break into mailboxes made of less sturdy materials. With the size to obtain small deliveries, they may be the perfect means to protect your incoming mail. If you get several packages delivered monthly and want added security, it’s best to look for mail box options for packages, like the Mail Boss Package Master. This will allow you to get a good and secure way to receive your parcels.